What have we gained from demonetisation? This is an EOD record of my option trades in DEC series. Previous records are available here. 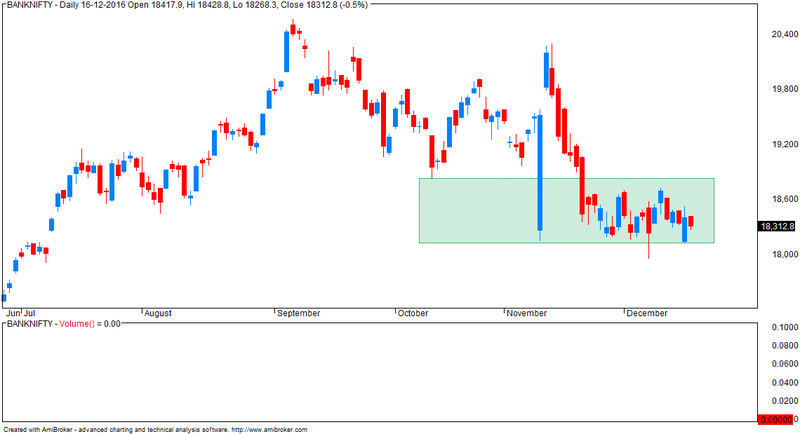 Nifty opened mild gap down at 7965 but declined sharply just after opening and traded with negative bias for rest of the day. Nifty declined more than 80 points before closing 77 points down at 7908. Yesterday, one more decline towards 7942-7932 was expected and then suggested to buy Nifty in 7942-7932 range using exact stoploss of 7915. 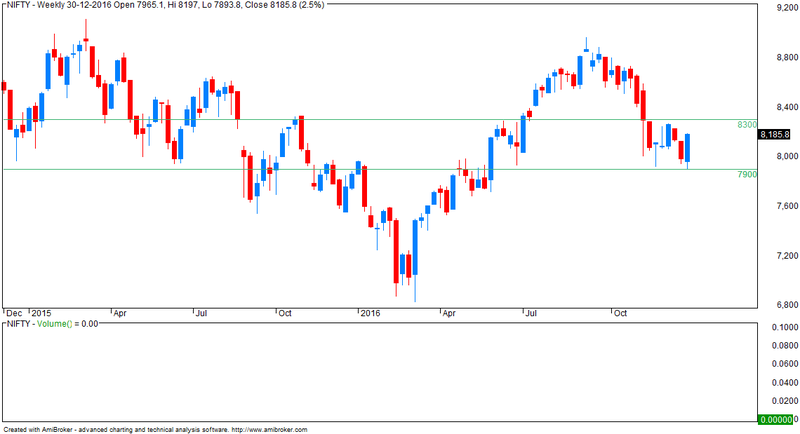 Nifty declined till expected range but failed to bounce back and further declined below 7915 triggering the stoploss. The possibility of Irregular Pattern we were expecting is also negated after touch of 7915. Let’s have a fresh look at latest charts for further scenario. It would also be interesting to see if ‘2016 closes below the lower trajectory line at 25500. Remember, the lower trajectory line is a rising one, and therefore, its value for ‘2017 is about 29000. Since 29000 is way higher than the current levels of about 26000, the year ‘2017 would surely open below the lower trajectory line. The question is whether this could lead to larger disastrous consequences like it did after breaking lower trajectory line in ‘1995 and ‘2008. At this point, we are only raising the technical concerns and not drawing any conclusions. 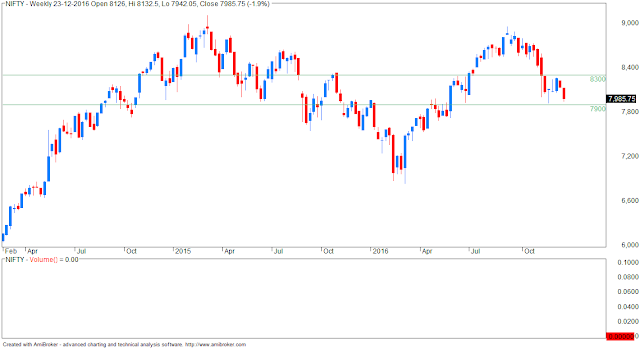 This is because Index is close to our downside target area of 25000-500 (Nifty 7700-7800), against which, Index has already hit a low of 25718 (Nifty 7916), which is within the tolerance levels of 1-3% allowed under NEoWave. Trend is down on daily and weekly charts... no visually obvious support visible. Many people refused to accept my fast trade of 26-DEC.
Well here is the contract with timestamps. 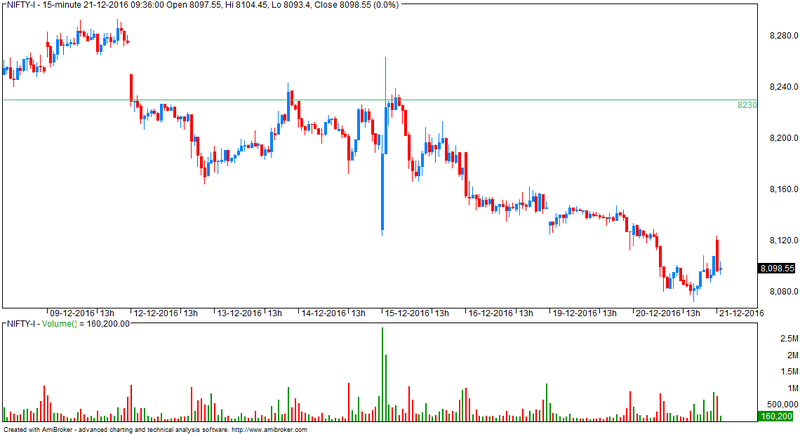 Bought 7900 PE at 9.25am and exited at 10.00am. Note the high for the put was around 45 but then you cannot exit at highs. Was out of the house by 10.15 (no contract note here). Disclaimer: there have been many trades where I have lost money at the same speed. But the value of profit making trades vastly exceeds that of loss making trades. 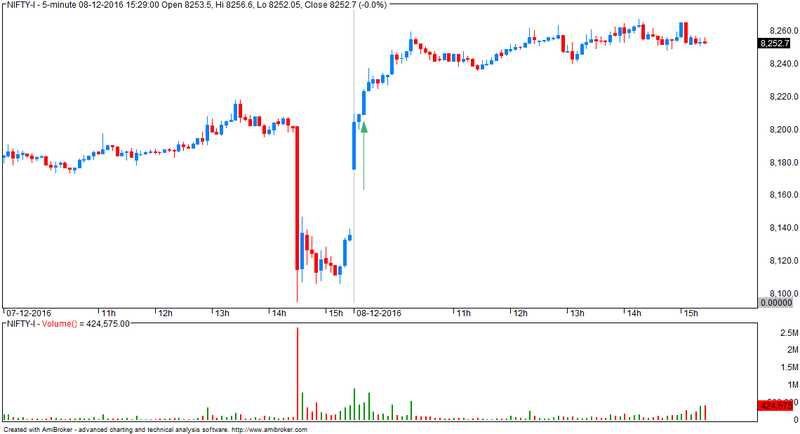 - below 7900, fall of another 200 points possible. 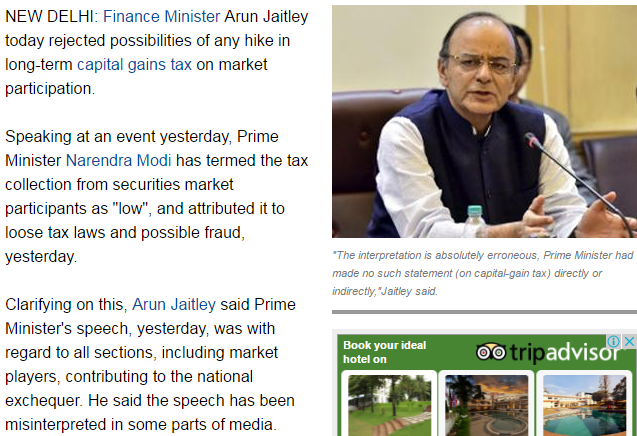 Now, Jaitley says cashless means less cash, not no cash... just as expected. 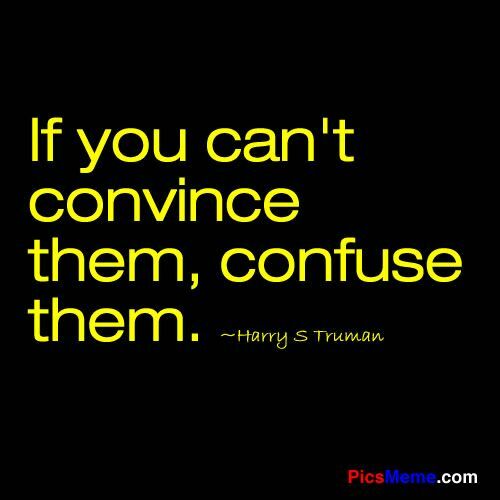 3 Cs in politics .... convince, corrupt, confuse. The last C always works. 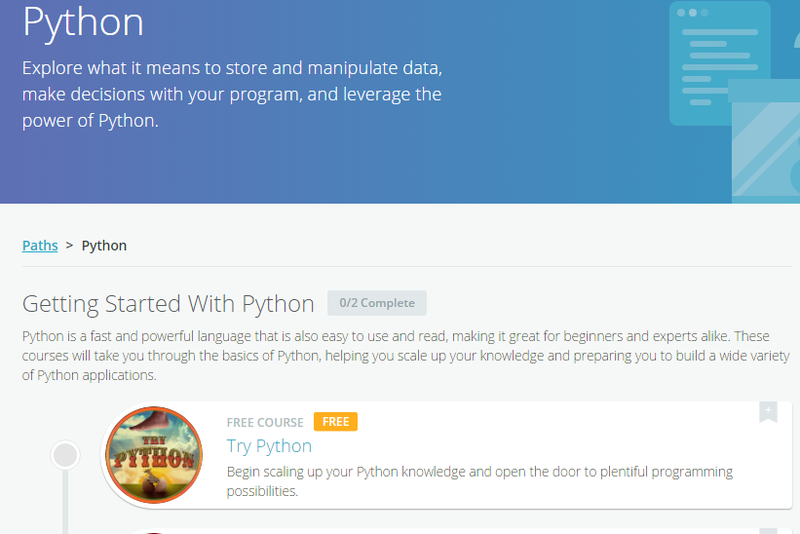 Just started learning Python. At 50+ the fun just starts. Learning should never end. And one is never too old to start learning anything. Cashless to become "less cash" ? This is is based on my understanding of how words are being used or will be changed in light of changing circumstances. Recall that when demonetisation was launched, the significant keywords were terrorism, black money and corruption. This was supposed to solve all problems and evils in India. But we know that all cash is not black and all black money is not cash. So in past 2 weeks, these were replaced by cashless or go digital. 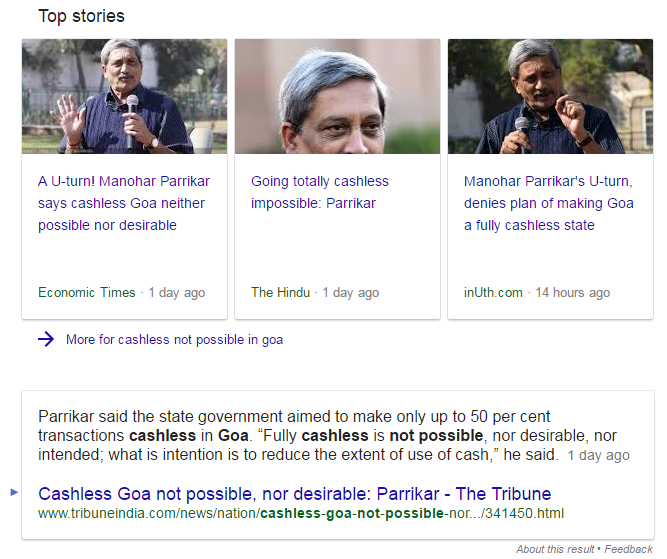 Everyday, any TV channel or newspaper you read, it was always cashless, cashless and cashless. Now going cashless is not easy... where the vast majority of Indians have not been to a bank or used a smart phone, it is silly to assume they will start using debit cards, credit cards or download apps and be cashless overnight. 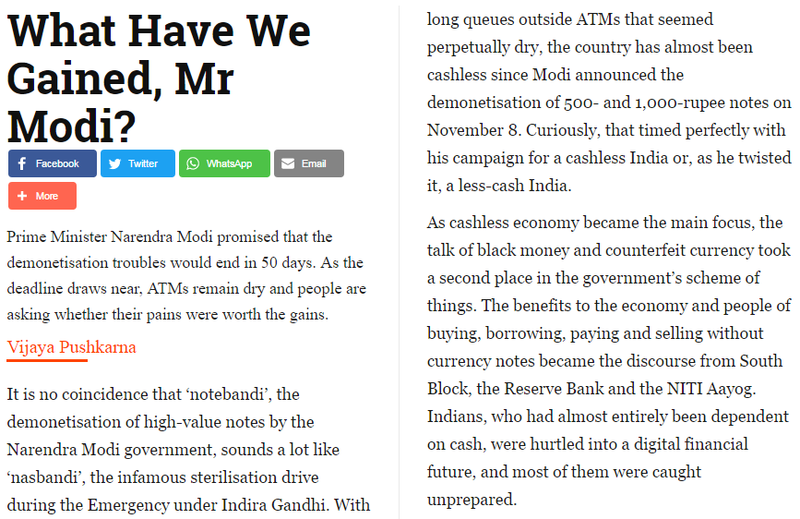 So expect politicians to start saying/ replace "cashless" with "less cash". This will be a very important shift in the days going forward. The aam admi or mango people will not realise this shift. Not surprised... there was never any plan in the first place. This will be a good move for the economy. There is no reason why long term investors should not be taxed for their profits. 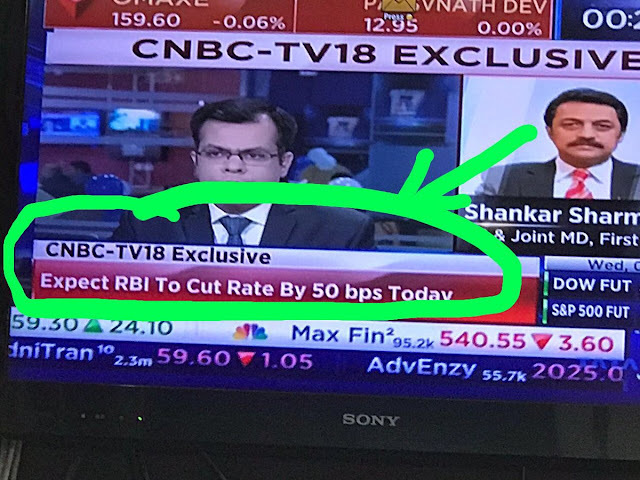 FIIs should be indifferent to this. In fact, the differentiation between short term and long term trading/ investment should be completely done away with. This will also reduce tax evasion using the penny stocks route. Retail Traders are once again increasing their open interest in index options since Dec 10th. It shows that speculative money is bullish since Dec 10th and so far lost to the index call writers and markets too remain in sideways through the series. It is to be noted that Retail traders during Nov 2016 series went record longs in naked call options and market doesn’t favored bull speculators during November series. And for this series still we have 6 more trading sessions to go and Indian Market is the best underperformer compared to any other major world markets. The dollar is supreme and the only giant sucking sound, we have heard so far, is of money going back to the United States and that is something which doesn’t bode well for flows to emerging markets, but there is more fundamental problem out here which is the emerging market growth model is sort of under serious question and this is what is going back to my earlier point about Trump presidency with two changes that they are going to make or are very serious about making. One of them will pass for sure, the other one, I am not sure but this has major implications for India. Take the first thing that they are going to reduce the corporate tax rate, from 35 or something that they are talking about to 15 or 20 percent, this is huge because here is the largest market in the world which is reducing its corporate tax rate from 35; effective it is a bit lower but 35 is the top rate down to 15-20 or something, that is huge because why would anyone invest outside their domestic market and it is so large, when the corporate tax rate is being brought down so dramatically. The second is much more controversial but with even greater implications for India which is that they are discussing something called destination tax. The destination tax implication is that exports are going to be tax-free and imports are going to be taxed – that’s a very crude way of putting it but that is what they are talking about. If that were to go through – that would mean the entire outsourcing model to emerging markets or even exporting your way to prosperity model which is how many emerging markets have grown rapidly, Korea, Taiwan, China – that model is going to be seriously impaired. 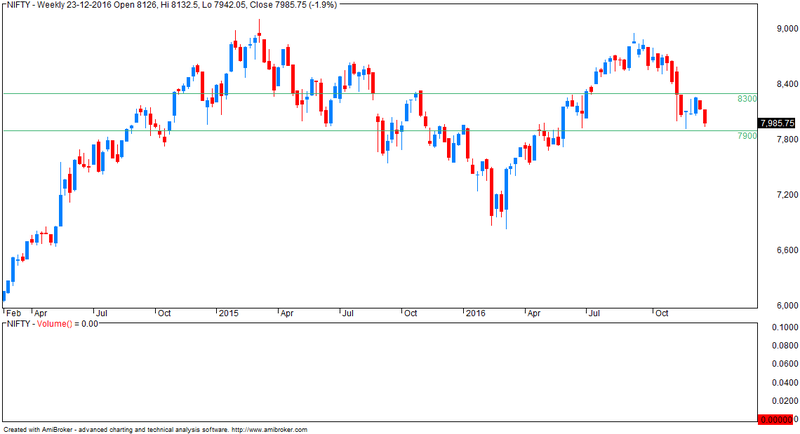 - break and weekly close below 7900 can lead to a big correction. - today there was a drop in open interest in 8200 CE, 8300 CE and 8000 PE options. - this may mean that some traders may expect 8000 to break and some expect a sharp pullback from here. Incidentally, next month (JAN series), OI is highest at 8000 PE and is NOT decreasing. 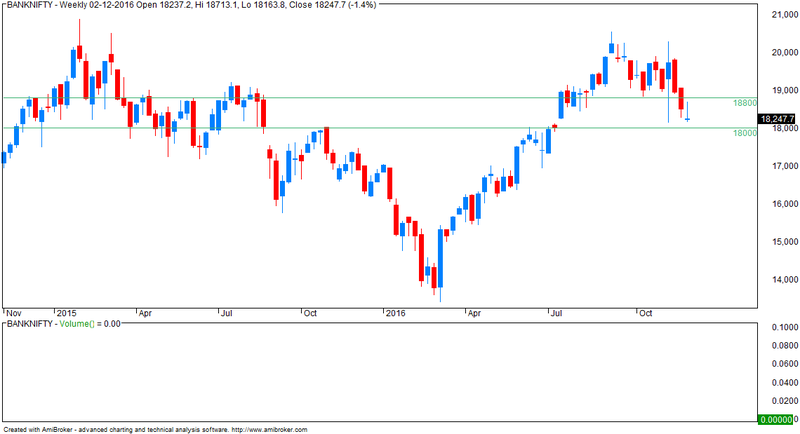 Since Thursday’s low was also the low of the week, we may consider the low of 26407 (Nifty 8121) as a crucial level on downside even for the fresh week. Remember, Thursday’s low was hit after a gap-down open post Fed policy, but Index also bounced strongly from the low. 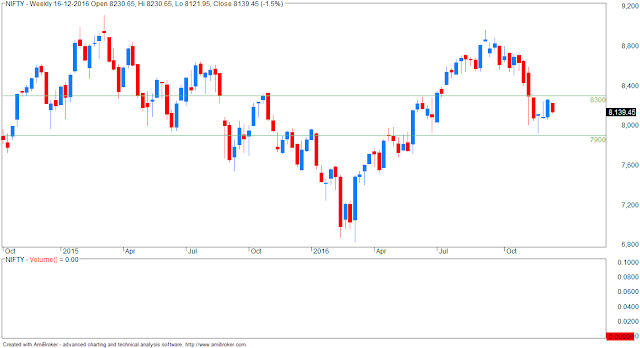 However, we can say for sure that no further upsides can open until Index can crack decisively above the 50%-mark, and no further downside can open until it can decisively break below last week’s low. 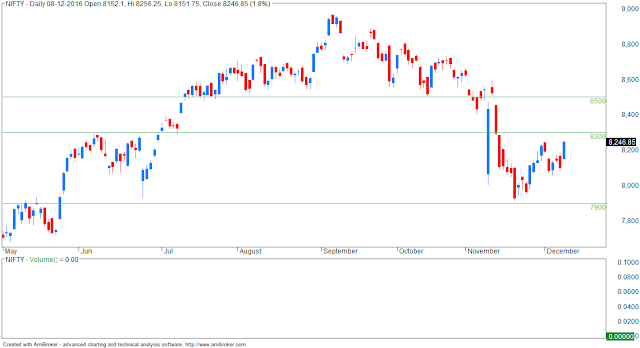 Index made several attempts to cross 50% retracement level in the last 3 weeks. If b-leg ends without crossing 61.8% mark, it would mean that the a-leg fall was “impulsive”. If a-leg was “impulsive” and b-leg corrected less than 61.8% of a-leg, then the larger “e” could be developing as a Zigzag. As per NEoWave rules for the Zigzag, the c-leg of a Zigzag should break below the bottom of a-leg, i.e. Index should hit a new low for the fall. 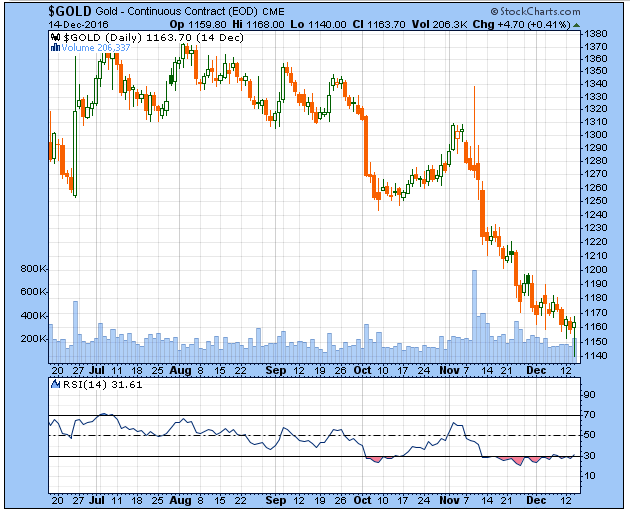 I use (mostly) 15 min charts for option writing. NF gave a sell signal on 12-DEC around 8230 F. Today NF is at 8100 giving a profit of 130 points. - open interest at 8000 put and 8300 is almost same. The government and RBI have constantly shifted the goalposts in the demonetisation drive, chopping and changing rules at a confusing pace.But this latest notification hits a new high in whimsicality. 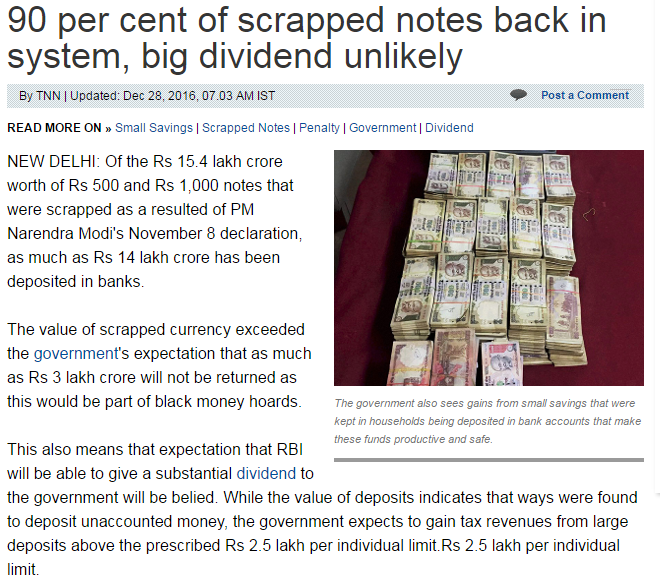 The government had clearly announced that old notes could be deposited with banks till Dec 30. The finance minister had appealed to people not to rush to banks in the early days and add to the queues. And yet, we now have the government and RBI saying anybody depositing over Rs 5,000 in old notes will be questioned by bank officials and must give a "satisfactory explanation" for why they haven't done so earlier. As it is, honest, hard-working citizens who pay their taxes are being denied access to their own money - forget the weekly limits, six weeks after they were told things would be okay in two-three weeks, they are returning from ATMs and bank branches empty-handed after standing in line for hours. What's more, public utilities have stopped accepting the old notes. Now, to add insult to injury, they are being told that for as little as Rs 5,000, they will be treated as suspects merely because they decided to wait till the crowds at banks thinned - as advised by senior ministers and government officials themselves. This is just not acceptable. It is now time to draw the curtain on the intense pain, dislocation and hardship caused to honest citizens across the country by demonetisation. But instead of doing so the government in its inscrutable – indeed incomprehensible – wisdom, has introduced more and pettier regulations. People with old notes which exceed Rs 5,000 in value will be allowed to make just one deposit till 30 December. And that deposit can be made only if two bank officials can be satisfied that there is a good reason for not having made the deposit earlier. This is a draconian, Soviet-style measure that could amount to seizure of people’s assets. It empowers bank officials beyond their remit and is likely to be misused, generating further corruption and black money. This measure should be repealed. 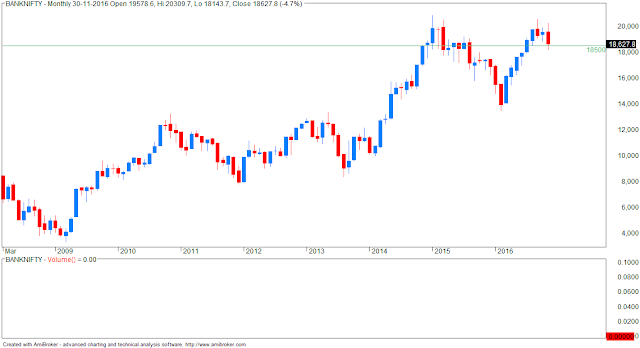 - index is rangebound; net move this month is 1% minus. Just about 35% of India's population uses internet. So if the government wants to transition to a cashless or digital economy, it will take some time and lots of effort. I am in the 1% with internet speed in excess of 30 MBPS. This demonitisation started with issues of fake currency/ terrorism. In the same breadth, black money was added. 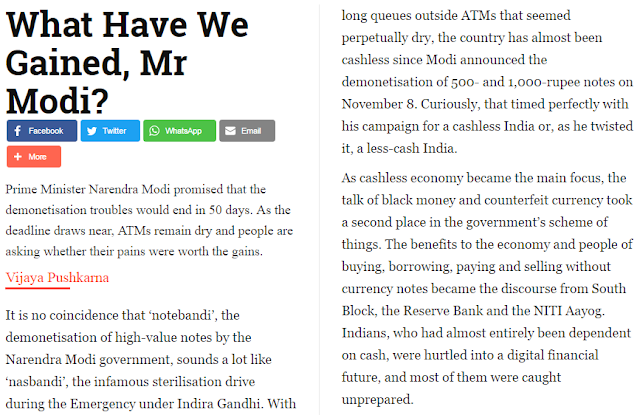 But at that time there was absolutely no mention of becoming a cashless economy or going digital. The same has been added as an after thought knowing that earlier reasons (black money, fake currency, terrorism) are no longer valid (proof: no one talks about these issues today). Black money: no change. The smart guys never kept their cash in currency. Only the small fry (20-30 crores get stuck)... the big guys are not bothered. Corruption: no change. The local cop or govt employee will now ask for new notes. Worse, he gives the old ones back and ask you to replace them. 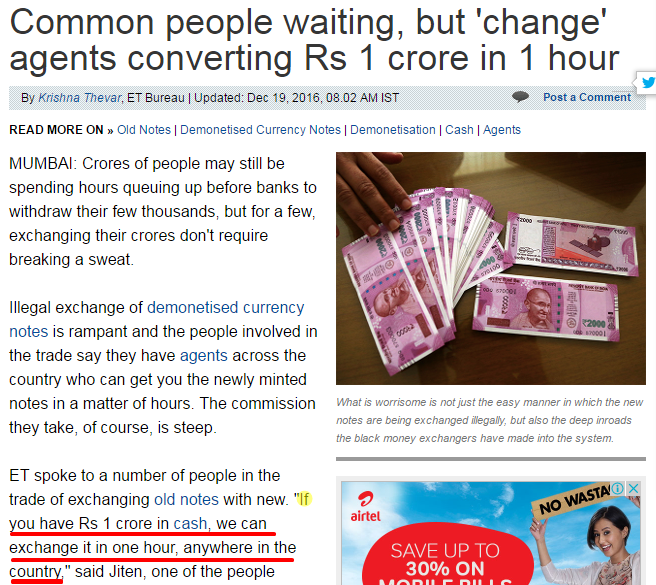 Every day, you read about people being caught with 1-2 Cr of new notes. While the aam admi (or mango people like me) are standing in lines to withdraw 2000 per day even as my bank balance is substantial. How is this possible? Have you seen any rich person or politician from your locality standing in serpentine never ending bank queues? So what do you do in a situation like this? Sell another dream and in current context it is about going cashless or digital. This will supposedly solve all our problems. It will not. Repeat... it will not. Some bit of a reality check. Kenya is one of the world's most mobile aware and connected countries. About 5% of the GDP gets transacted thru mobile phones. But it still remains one of the world's most corrupt and poor countries. Digital economy will not be possible in India for quite some time. Where internet penetration is 30% and the vast majority of population uses ordinary phones, it will require tremendous optimism to expect them to have a gmail account, download apps, know how to set and retrieve forgotten passwords and finally transact. Daily charts - index is rangebound. Refer weekly charts for levels. Note RSI is at bear market resistance. This is a part of the learning process... once self driving/ autonomous cars become popular, signals will no longer be required. The DOW hit 10000 for the first time ever in March 1999. Today it is within striking distance of 20000. Over 17 years, the CAGR works out to 4%. 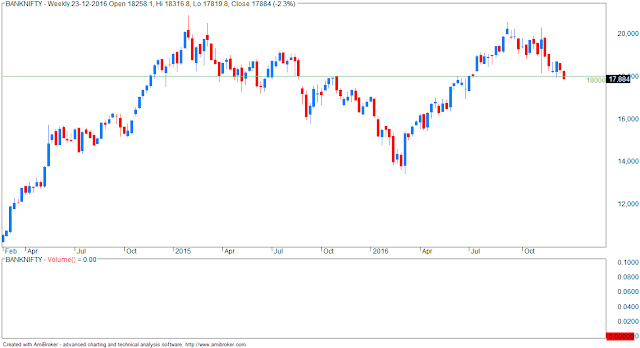 In comparison, NIFTY was approx 1100 in March 1999. At today's level of 8200, it has delivered a CAGR of 12%. Note: in both cases, patient is dead. In the first case, it was all planning and no action and in the second, it was action with no planning. 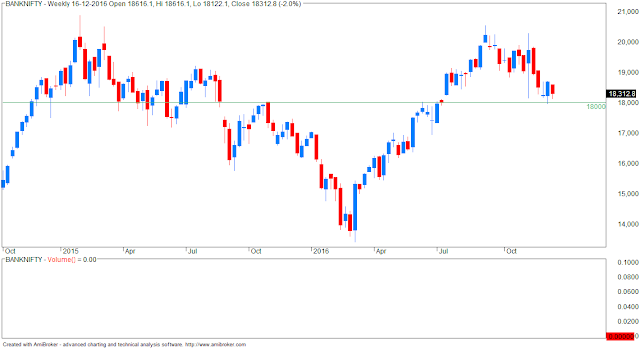 Nifty opened mild gap up at 8196 and declined sharply to register day’s low 8155 but bounced from lower levels and traded with positive bias for rest of the day. Nifty bounced by 70 points from low to register day’s high 8228 before closing 51 points up at 8221. 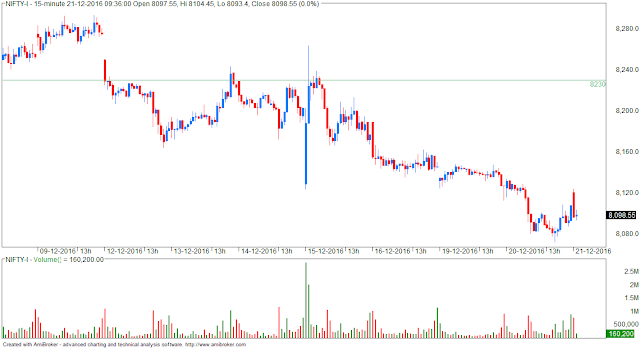 Yesterday, shorts were suggested in 8182-8199 range with stoploss of 8203. 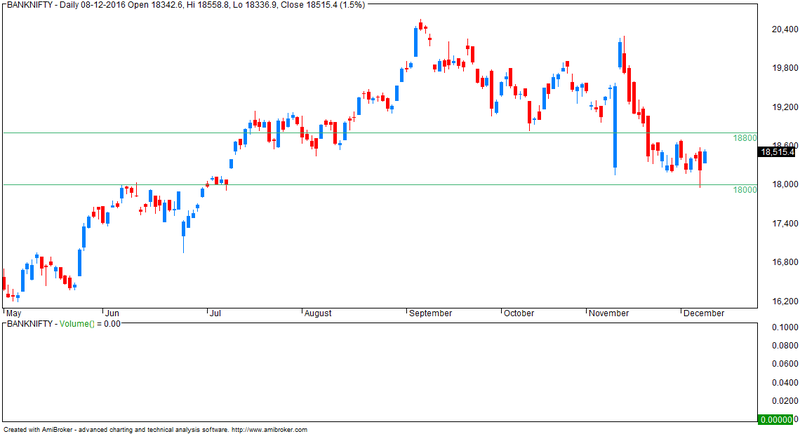 Nifty declined by 40 points after opening at 8196 but stoploss of 8203 was triggered later. It must be 20-25 points loss if traded. Let’s have a fresh look at latest charts for further scenario. Failure to trade above Friday’s high of 26804 (Nifty 8275) could be the initial sign of maturity of b-leg rally ahead of US Fed Policy coming Wednesday. Thereafter, if the Index starts closing below its previous day’s low, it would turn the Daily bias -ve. Remember, we considered that the b-leg started from 25718 (Nifty 7916), the low of 21st Nov’16. Inside the b-leg, Index still maintains higher top higher bottom formation on its Daily close-only chart, which defines an up-trend as per Dow Theory. 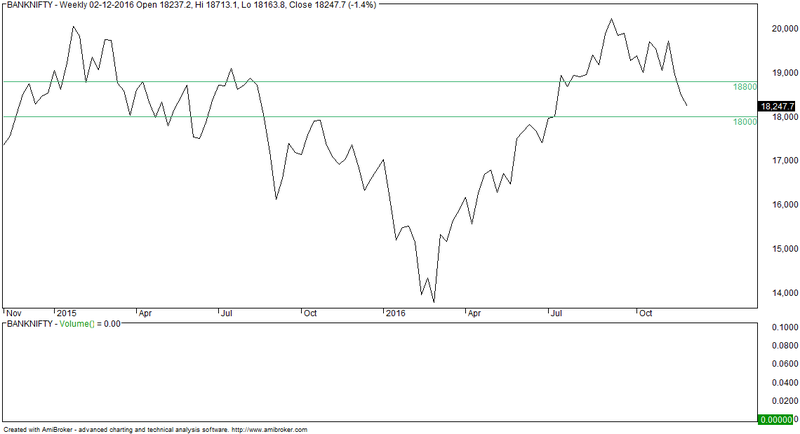 Inside the b-leg, Index has refused to retrace its rising segment fully in faster time, so far. By NEoWave, complete and faster retracement of rising segment is the next step to confirm that the +ve structure may be completing. 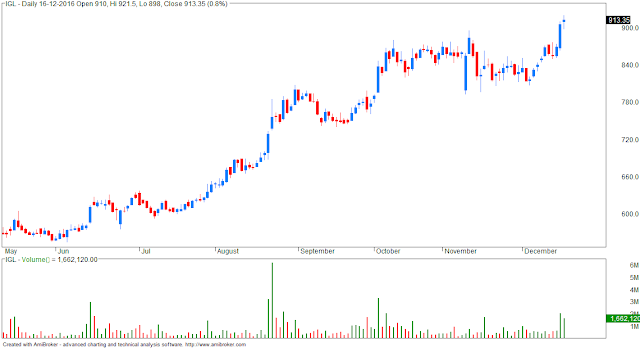 Thereafter, a larger structurally -ve sign would comprise of Index falling into a lower top lower bottom formation on the Daily close-only chart. Back from a short break. Trip was planned few weeks ago and I got excellent deals on the flight tickets. 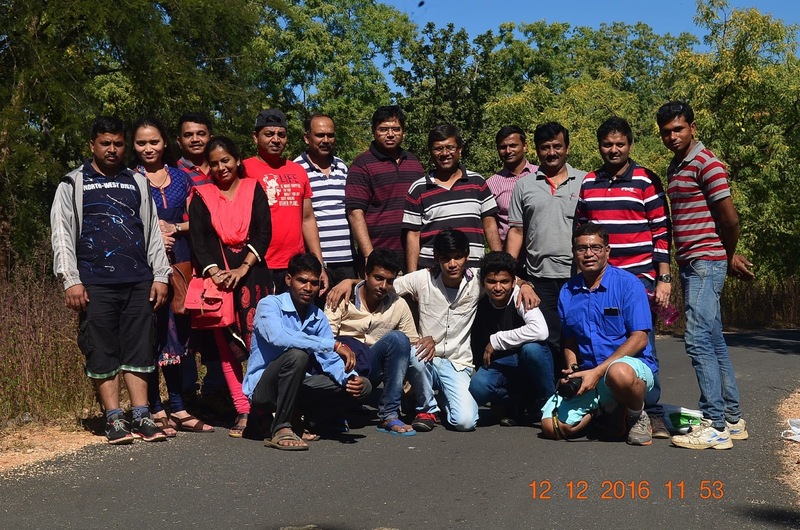 The highlight (rather objective) was a big nature trail walk in Pench National Park... this is on the border of Maharashtra and Madhya Pradesh. I am the guy in the blue shirt holding the SLR. Here are some more pictures... note taking pictures is difficult as everything looks the same. Also, pictures do not do justice... the real fun is in the experience/ walk. - today, markets traded flat. 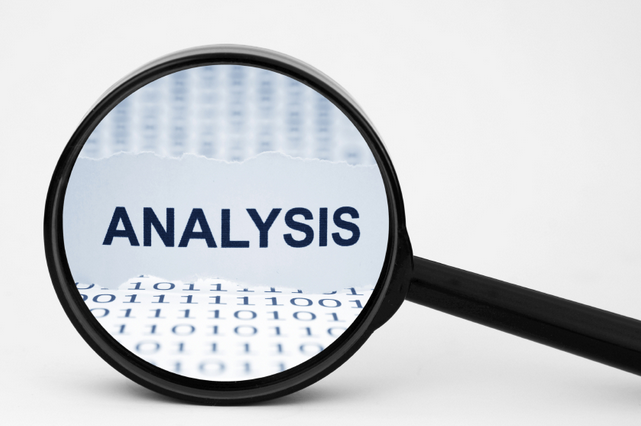 There is an inverse relationship between analysis and trading results. More analysis or being able to make distinctions in the market’s behavior will not produce better trading results. There are many traders who find themselves caught in this exasperating loop, thinking that more or better analysis is going to give them the confidence they need to do what needs to be done to achieve success. This trading paradox is something that most traders find difficult, if not impossible to reconcile for the simple reason you can’t use analysis to overcome fear of being wrong or losing money. If terror funding hit, then how did Nagrota happen? 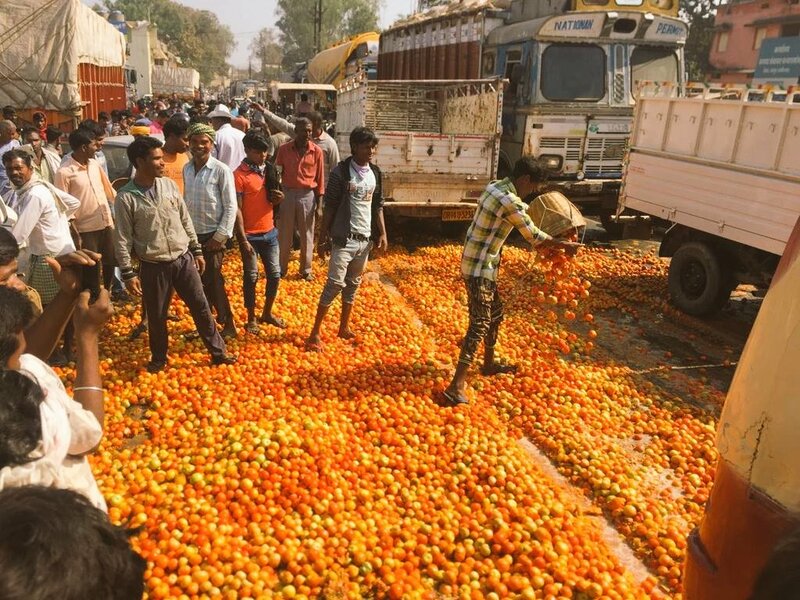 India to celebrate La Tomatina festival thanks to Demonetisation??? No choice for poor farmers... how can you sell tomatoes at Rs.2/- per kg and feed your family? Cheaper to let it rot in the fields than take it to the mandi. ALLAHABAD: Many MBAs, other post-graduates and BTechs are among the 1.10 lakh candidates braving the morning chill to take the practical examination of cleaning drains to bag jobs as contractual sweepers (safai karmcharis) with the Allahabad Municipal Corporation (AMC). Given the large number of applicants, the process is expected to take around 408 days. Sources claimed the recruitment may be further delayed if there is a change in government after the Uttar Pradesh assembly electi ..
Demonetisation is on course to claim yet another victim. The roll-out of the Goods and Services Tax (GST) regime is set to miss the April 1, 2017 deadline. It looks increasingly improbable that the three GST enabling Bills — Central GST, Integrated GST and State GST — could be passed in the remainder of the ongoing winter session of Parliament, which concludes on December 16. The three GST Bills are money Bills to be taken up by the Lok Sabha. On Thursday, the Business Advisory Committee of the Lok Sabha, which allocates time for the Bills and discussions to be taken up for the forthcoming week, met but the government strategists didn’t ask the members to allocate time for the GST Bills for the next week. Union Finance Minister Arun Jaitley has cautioned of a constitutional crisis if the GST is not rolled out by mid-September 2017, the one-year validity of the GST Constitution (amendment) Bill. However, Yechury disagreed. “This might be his interpretation, but there are ways out of that imbroglio,” he said. Constitutional expert Subhash Kashyap, a former Lok Sabha Secretary General, says such a situation was unlikely to arise, but even if it does there are ways out. If you thought November was ugly, brace yourself for even more outflows from Indian assets in December, according to Deutsche Bank AG. Foreign funds pulled money from Indian stocks at the fastest pace since 2008 last month as Donald Trump’s surprise election win spurred expectations for more rapid interest-rate increases in the U.S. and Prime Minister Narendra Modi’s cancellation of high-denomination bank notes hurt cash-based business activity. The bond market wasn’t spared, with the biggest monthly exodus since the taper tantrum in 2013. 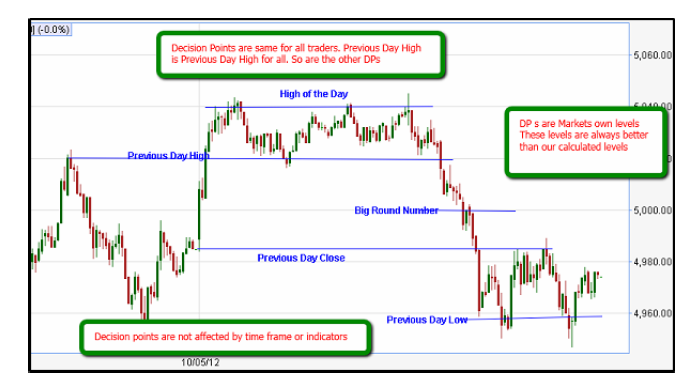 Decision points are price levels where day traders are expected to act. Most of the time, these are levels where a demand and supply imbalance existed. 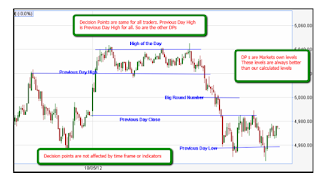 My trading revolves around these points and I expect the traders to act forcefully at these areas. These are reference points to navigate the chart space. Day traders are creatures of habit and I assume they act at these levels again and again. With demonetisation set to reduce India’s economic growth by 1% over the next one year, the job market is likely to see over 400,000 job cuts. You should worry if you work in the e-commerce sector, since firms could handover around 200,000 pink slips in the next one year. “Cash on delivery being almost 70% of the overall e-commerce business, the sector is likely to take a hit and lose almost 20% of their headcount in the next few months,” said Rituparna Chakraborty, co-founder at staffing firm Teamlease Services. E-commerce firms currently employ around 1 million people in India. Besides, the textiles and garments industry, which employ a substantial number of daily wagers, could be hit hard. Of the 32 million people employed by the industry, one-fifth are daily wagers, who mostly get paid in cash. “While on one hand, slow sales increase the possibility of stock returns to manufacturers or affect the order book for the next year due to unsold inventory; on the other, slow sales and consequent liquidity pressures on retailers can result in stretched payments to manufacturers,” according to rating firm ICRA. Similarly, 20% of the 250,000 workers in the leather industry will also be impacted. An anology ... You’ve withdrawn 85% of the blood from the body and only put back 5% or 10% slowly. Now if that happens, then the body will collapse – the same thing is happening with the economy. Money is actually used for circulation – nobody eats the money, you buy things with it. You know you buy from the retailer who then buys from the wholesale dealer, who then buys from the producer who then pays wages and that’s how circulation happens. This circulation is stopped. Now when you stop the circulation, these transactions don’t take place – whether it be in the unorganised sector, or be it in the organised sector, whether it be transporters, whether it be, teachers doing tuition or, doctors you know – so everybody gets affected. Demonetisation: All pain and no gain??? For the last few days, reports in the media have been indicating that the banks may end up receiving the bulk of the demonetised 1000 and 500 rupee notes in a legitimate manner. Economist Arun Kumar, who has done extensive work on black money, is optimistic that going by the present pace of deposit and replacement of 1000 and 500 notes, over 95% of the invalidated currency may come into the banking system. This effectively means that the entire “shock and awe” strategy of Prime Minister Modi, accompanied by so much pain and disruption in the lives of a billion people, ends up with very little black money being located and extinguished. This will be seen as a colossal failure of governance and there are serious implications of this failure. .... As of today nearly Rs 11 lakh crore of the 1000 and 500 notes are back in the banking system. There is another month’s time for the depositing of these notes. Kumar says if “the bulk of the money comes back into the system it will be seen as the most foolish decision by the government involving all pain and no gain”. 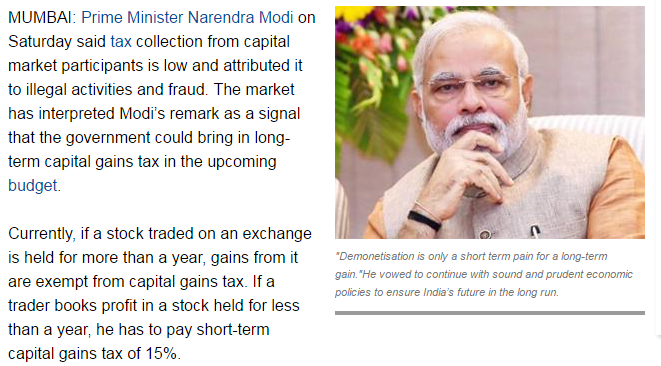 He says the whole exercise will then simply be described as replacement of current stock with negligible demonetisation, which was the original objective. After selling shoes, clothes, vegetables etc... now Reliance wants to get into the taxi business. Reliance is reportedly planning to buy all black & yellow taxis of Mumbai to mark its entry into the cab business. The company is currently said to be in talks with the taxi union. If the deal does go through, Reliance will likely be operating the taxis as part of a connected radio cab service. 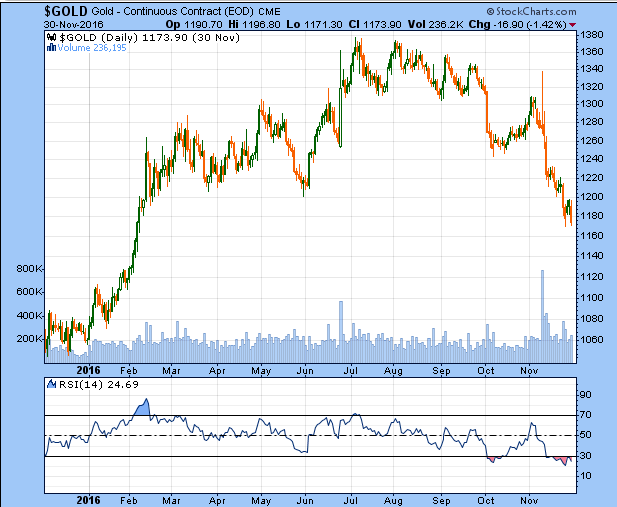 The Indian conglomerate is rumoured to have offered a buying price of Rs. 5 lakh for each taxi. This will include the license rights as well. However, the taxi union is pressing to increase this price to Rs. 7 lakh. As part of the proposal made by Reliance, each driver will be paid Rs. 20,000 for a day's shift and will be entitled to a month of paid leave, which the union wants to be increased to 2 months. These are the few points where negotiations are said to be stuck at the moment. Reliance has been eyeing the cab marketplace for a fairly long time. It was earlier reported that the company will be entering the business as a rival to Ola & Uber, throughout the country. Reports even suggested that Reliance was poaching drivers from other cab aggregators by offering lucrative proposals. It was also reported that the company was planning to use a CNG-only fleet to minimize operational costs. However, Reliance officials have been tight-lipped about this new venture. THE government expects the entire money in circulation in the form of currency notes of Rs 500 and Rs 1,000 which have been scrapped to come back to the banking system so that the tax authority can trace the transactions and tax black money hoarders, Revenue Secretary, Hasmukh Adhia said on Tuesday. This, effectively, undermines the prospect of any windfall gains accruing to the government arising out of part of the demonetised currency remaining outside the banking system. An estimated Rs 11 lakh crore has been deposited in banks so far and if the all the high-value notes in circulation comes back to the banking system as the Revenue Secretary indicated today, more questions are bound to be raised as to the cost and impact of the exercise of demonetisation spread over 50 days. That’s because the Centre for Monitoring the Indian Economy or CMIE, an economic forecasting agency, has pegged the cost of demonetisation for 50 days from November 8 to Dec 30 at Rs 1,28,000 crore which includes loss of business or sales, cost to households, the expenses for printing fresh currency notes to the government and the RBI besides for banks. The onus will be on the government to show that the gains, including in the form of stiff penalties on those found violating rules, negate the cost of the exercise. - you can see more examples here. Last week, Index formed a bearish Inverted Hammer type candle as a follow-up to the bullish Hammer type candle in the preceding week. Thus, initially it looked like a +ve follow-up to Hammer, Index did turn volatile/tricky, as we argued, because the 200-day EMA had turned. Remember, it takes 1-2 months to flatten a long term Moving Average like 200dEMA, before it can turn +ve. 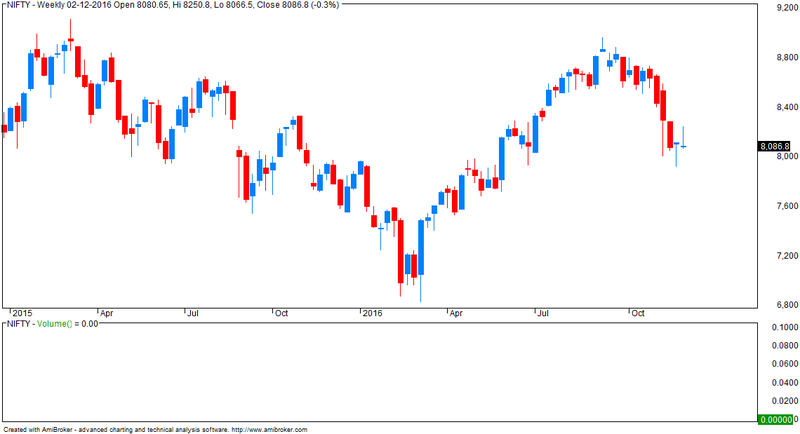 It only means that Index could remain volatile & tricky, at least for a few more weeks from here. Due to the expected volatility, last week we wondered how strong a +ve follow-up to preceding week’s Hammer type candle would be. Yet, we targeted Index to achieve 38.2% to 61.8% retracement levels on the upside. 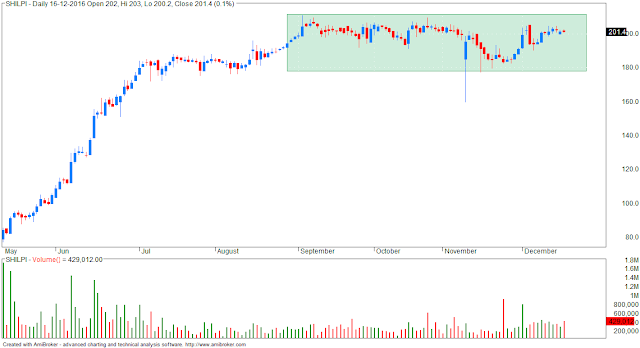 Index reacted only after it hit the 50% retracement level. 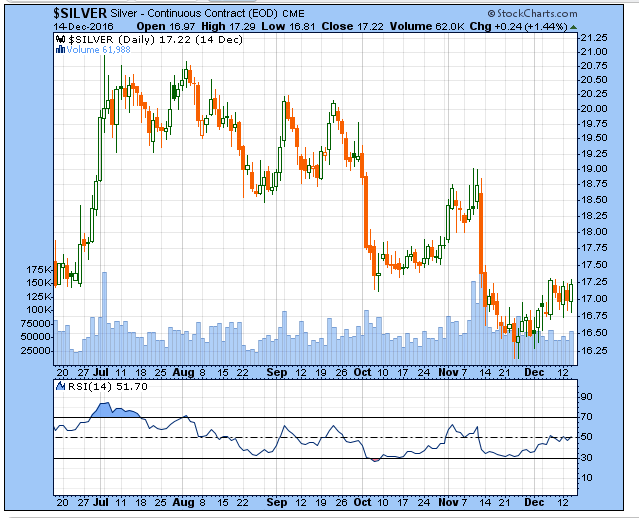 For the fresh week, we wonder how strong the -ve follow-up to “Inverted Hammer” type candle, formed last week, would be. 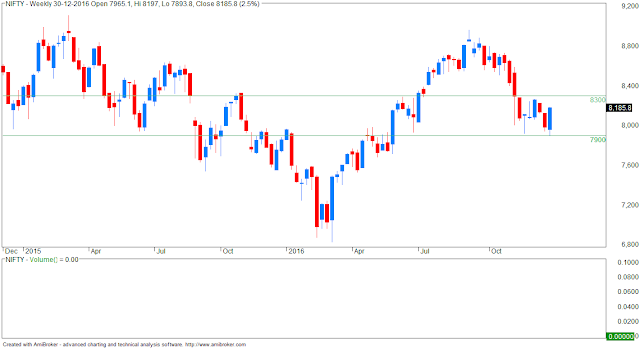 Nifty opened gap down at 8153 and declined further towards 8100. 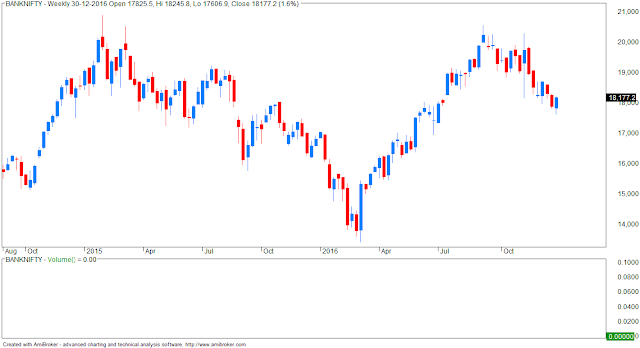 Nifty bounced from 8100 by 80 points to register day’s high 8159 but failed to sustain at higher levels and declined by be 90 points to register new day’s low 8070 before closing 106 points down at 8106. 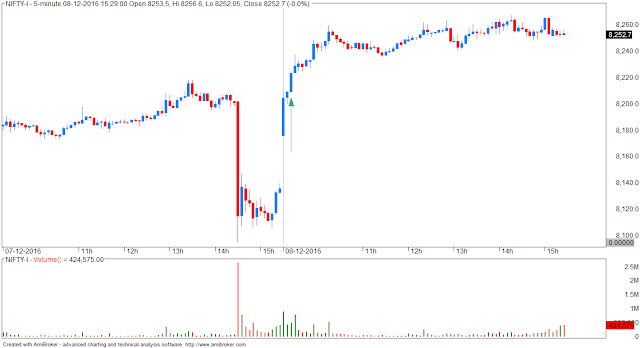 Yesterday, trading strategy was to hold shorts taken in 8231-8237 range with fresh stoploss of 8203 expecting targets 8122-8066 keeping trailing stoploss of 30 points. Nifty achieved both the targets but with 50 points bounce in between. We also expected a sharp decline towards 8066 because of extended wave (5) completed as Ending Diagonal Triangle which also happened. Let’s have a fresh look at latest chart for further scenario. 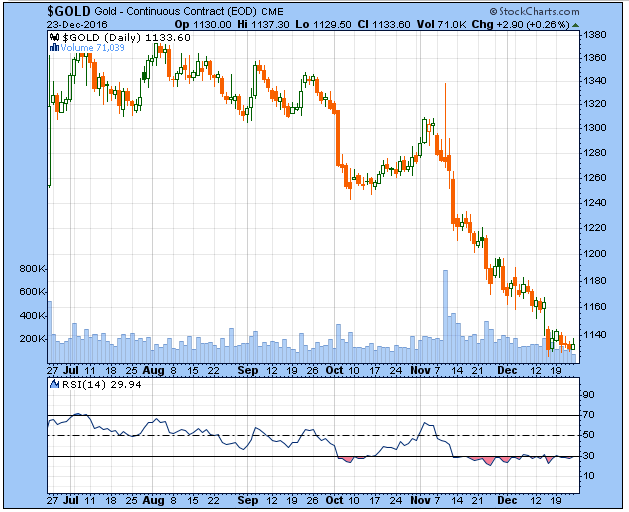 On line charts, trend is down and will reverse to buy on close above 20000. 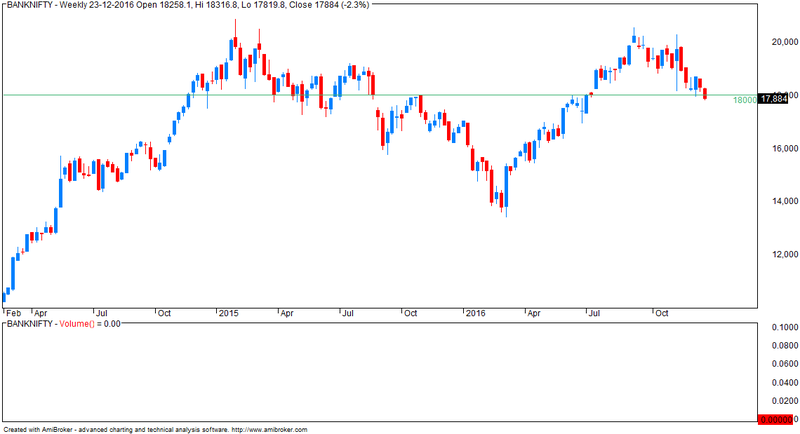 On candlestick charts, trend is down with resistance around 18800 and support 18000. Past 1-2 weeks, highest open interest has been in 8000 put meaning option writers are bullish 8000 will not break in DEC. Yesterday, OI remained highest at 8000 put followed by 8300 call (meaning upside is limited). Today, OI is still highest at 8000 put but there is a drop in open interest across a lot of calls and puts. Difficult to draw any clear conclusion. NEW DELHI: About 20 crore middle class young people would have no jobs or less jobs by 2025 due to increasing automation and improvement in technology, industry veteran T V Mohandas Pai said today. "By 2025 there will be 200 million young people in the age group of 21-41 with no jobs or less jobs and no body knows what to do with these people. Government policy does not know what to do as they don't have proper data,"
"Rule based jobs will get eliminated. Much of middle class people are involved in rule based jobs. Rule based jobs can be made by algorithms. Machines are still not creative. People who are creative will remain," Pai said. "Robots are taking over at large number of places. Robots don't want appraisal, they don't want work life balance. They work 24 hours. In Delhi, metro is going to be automated. Automobile industry which employees 1 in 6 people in the world is going to be automated," Pai said. The main reason given by the government for demonetising high denomination notes was to curb black money. Various estimates have been made of the quantum of such money which is not expected to be deposited in banks ranging from Rs 3 lakh crore to Rs 5 lakh crore. But if one goes by the deposit trends so far and the projections, the black money expected to be purged may be much less. On November 8, the total amount of actual cash with the RBI as CRR was Rs 4.06 lakh crore (Rs 4,06,900 crore), according to the weekly bulletin of the central bank. So, if we take the money deposited in 20 days and add the November 8 CRR to it, that amounts to Rs 12.50 lakh crore. If we further add a portion of the cash-in-hand on November 8, say Rs 50,000 crore, the total amount of money which is not with public in old notes is Rs 13 lakh crore. There are still 30 days left to deposit banned currency notes. At the rate at which money is being deposited, it stands to reason that Rs 2 lakh crore or more would come into the system till December 30, thus throwing to the winds all calculation of the government to tackle black money. Either the black money is not in high denomination notes or those who have such money may already have put it back into the banking system. 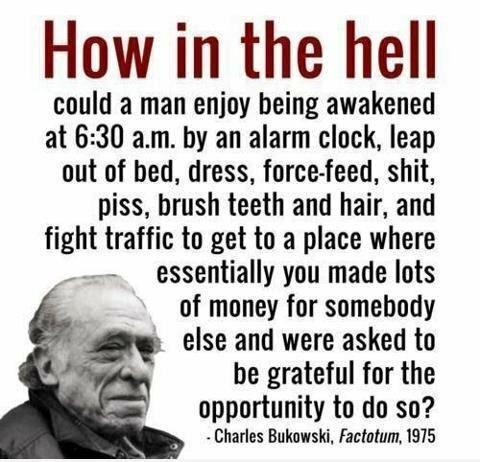 How the hell can someone get up early in the morning for someone else? ON DAY 21, surging deposits of over Rs 9 lakh crore in banks — more than 60 per cent of the total value of 500 and 1,000 rupee notes in circulation — have stirred a debate in the government about the stated objective of the demonetisation scheme, which is to break the grip of corruption and black money. Bankers and analysts estimate almost 90-95 per cent of the money will return to the system, with more than a month to go for the deadline to deposit the scrapped notes. The Income-Tax department, meanwhile, is grappling with a possible situation of people depositing significant amounts of undisclosed money and taking it out soon after the restrictions on withdrawal are lifted on December 30. Indeed, the government and the BJP’s narrative over the last one week has taken a subtle turn from the original buoyant estimates of reaping a Rs 3 lakh crore windfall — the quantum of black money that will not return to the system — which can be used to invest in public infrastructure.